A sticking or hard to turn ignition key means trouble ahead. And it could be expensive trouble if you ignore the symptoms. We strongly urge our customers to fix the problem at the first sign your key starts to stick or jam. When your key is working, replacement of either the tumbler switch or the steering lock is bearable. But, if you wait too long, you may not be able to turn it at all. You could get stuck somewhere not being able to start your car or even move it. In most cases you will have to pay for a tow to a shop. Then ignition tumbler and lock replacement can become a huge hassle and very expensive. Labor to pull it out can triple and you may have to buy a complete new steering lock and switch assembly. A word for the wise: Don’t wait to fix a sticking ignition key! Sticking key immediate solution #1: If your key appears to be worn have a new key made. Many times that will solve the problem. Early key replacement can prevent additional wear to the tumbler and lock assembly and save you money in the long run. Keys can be made by experienced locksmiths or a Mercedes dealer can make a new one for you based on your vin number. If a new key does not solve the problem move on to #2. CAUTION: A worn steering lock can also accelerate tumbler wear because it puts extra stress on the key. In most cases where it becomes VERY difficult to turn the key (use of brute force or multiple attempts) you may have to replace both the steering lock and the tumbler assembly for a permanent fix. We have new steering lock assemblies on our website for most models from 1973 to 1991. If you have to drill out and force remove jammed steering lock you will end up needing a complete new assembly that includes the steel black tumbler cap ring. We can assemble a complete assembly here in our shop so it arrives ready to install in your vehicle. 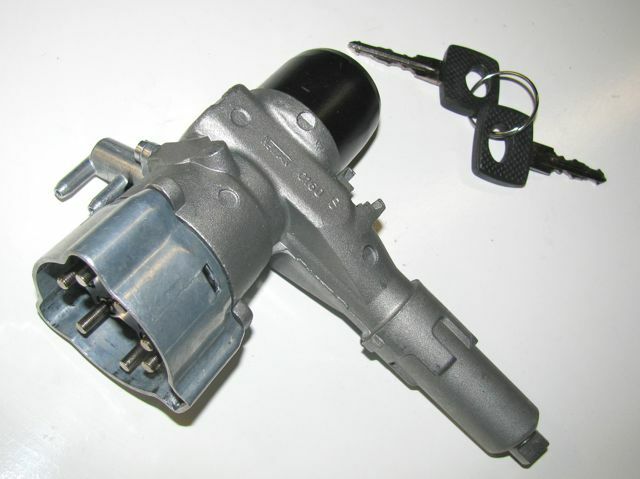 We include the steering lock manual free of charge with this unit. Removal and replacement will require getting into the dash and standing on your head. It is not a fun job. For assemblies that do not have a key or key has been lost or the key will not turn at all - you will have to perform emergency surgery on your steering lock assembly. 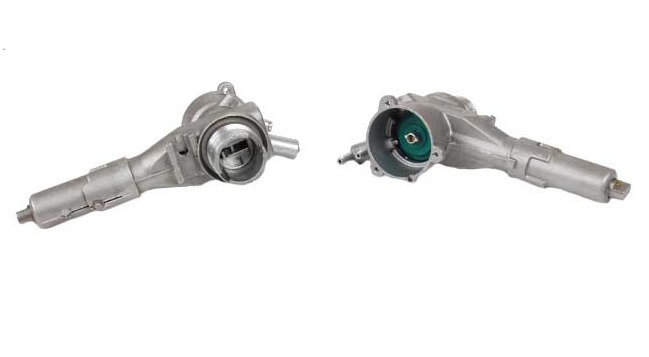 Both the standard and emergency removal procedures are covered in detail in my manual Ignition Steering Lock Assembly, Removal and Replacement, which can be purchased in a PDF Download or printed format (see products to the right) . When installing new steering locks always a good idea to replace an older electrical switch. These mount on the back of the lock assembly and are VERY easy to replace with the lock is out of the dash. NOT so easy when you have to do it in the car! If you have a later model or you want to view a REAL GOOD reason why you want to fix it early you must see Kent's marathon on demand video (see related products). The owner of this car thought he could just ignore a sticking key! 240D 300D 300CD 300TD 300SD 380SE some 300SE 300SEL 420SEL 560SL 560SEC 560 SEL ( 1981 to 1989 only ) --- WILL NOT FIT ANY 107 CHASSIS BESIDES 560SL. Works only on years listed - Read description carefully - FREE installation manual included. 116 300SD NEW Steering Lock Assembly with Tumbler Installed, and 2 Keys - Manual Included. 1978 to 1980 models - vin number 116.120 - from 000231- ALERT! This is your only source for new tumbler and keys.